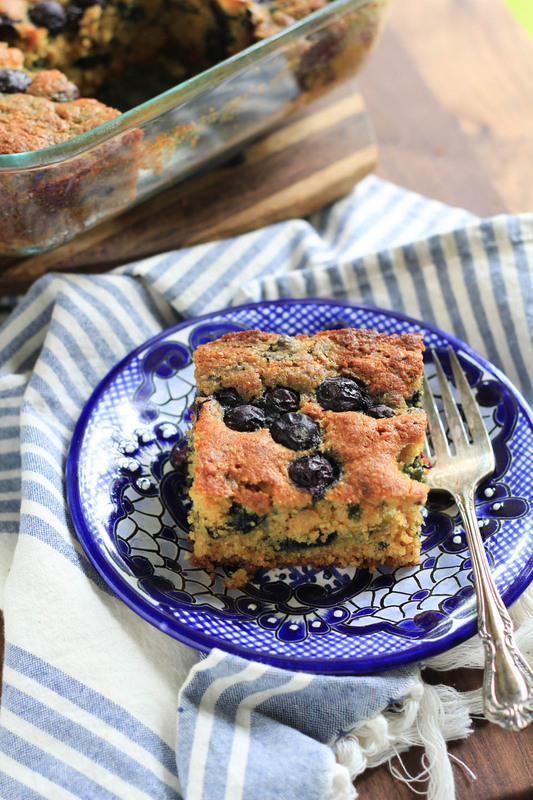 This Blueberry Cornmeal Cake is the epitome of Summer desserts in my humble Pacific Northwest opinion. 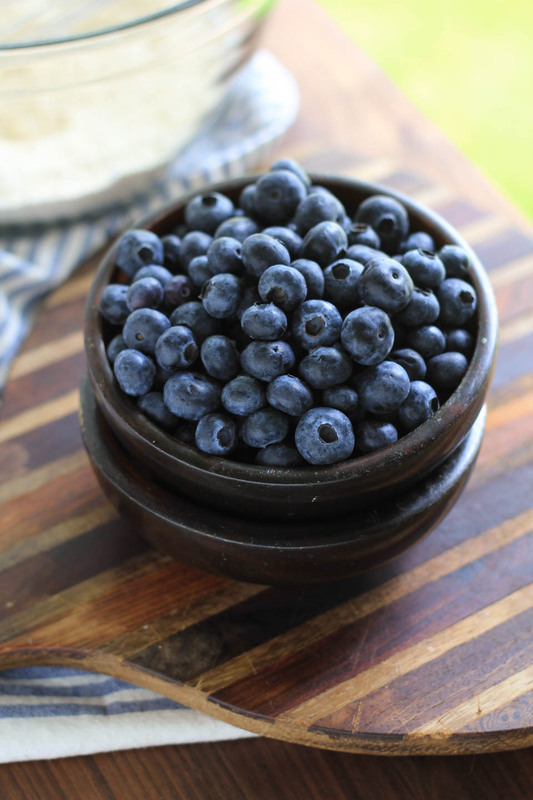 It is subtly sweet from the blueberries and cornmeal, which both also give it a texture that is so perfect for a Summer sweet treat. It reminds of me of Europe, sunsets, or morning coffee with a square serving of sheet cake. There is something so homey about a sheet cake. You know I love my cast iron pans for cakes, and I was totally tempted to make this in a cast iron pan, but I loved the simplicity of old school pyrex square for this one. It also retains the tender crumb of the cake better and gives up a little extra tall slices, which reminds me a classic cakes from our childhoods. I don’t know about you, but so many cakes as a kid came in a sheet pan in one form or another. Especially as Pyrex got more and more popular, because it’s so easy to clean right? We’re upping the game here on this cake too, it was Brian’s idea! Because blueberries tend to sink to the bottom of cakes when baking, he suggested making it a swirl cake, how awesome is that?!! I loved the idea, and it’s super simple. I just mashed some berries and added it to a 1/4 of the cake batter and added in the swirl right before baking. Another touch and nod to an old school classic swirl cake. I did add more berries at the top for bursts of fresh berries for good measure though. 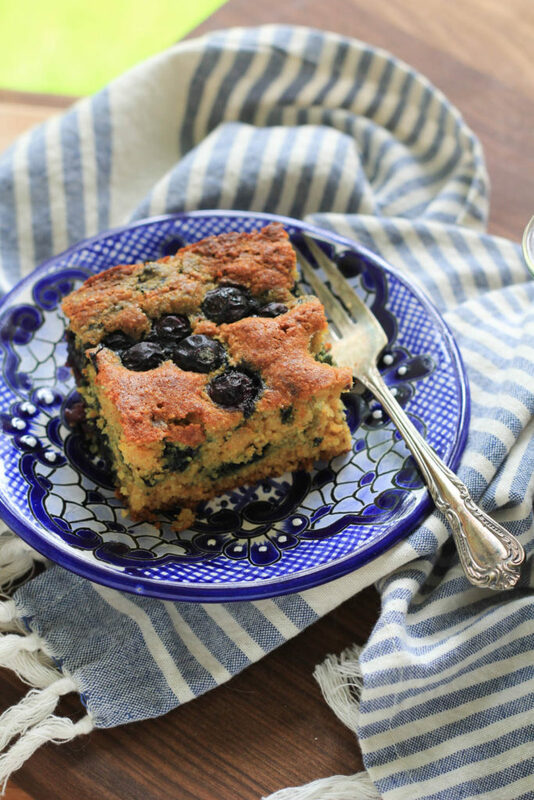 Can’t have too many blueberries in a blueberry cake! I made this with whole wheat pastry flour and white flour. Both are perfect in this recipe, it just depends on what you’re wanting. I made it with whole wheat flour because it has a lower glycemic index for people with diabetes or need for complex carbs, even though it has sugar. I am not a dietician, but I do this for my Mom who needs sweet treats to be a bit healthier (against her opinion lol), but still super delicious. A note on the sweetness, this is not a super sweet cake, it’s subtle and perfect for brunch, bbq’s, and take camping! I’ll be hanging out with Helen on ABC’S KATU CH2 AM Northwest Wednesday July 6th at 9-10am making this cake! Tune in! Place oven rack in center of oven and preheat oven to 375 degrees. Butter an 8 inch square oven safe baking dish. Mash 1 cup blueberries in a large pyrex liquid measuring cup using a large fork or masher. Toss other cup in a small bowl with 1 teaspoon flour. Sift cornmeal, flour, baking soda, baking powder, and salt in a large bowl, then whisk to combine well. Place buttermilk, egg, melted butter, and honey in a medium bowl, whisk vigorously to combine well. Add liquid mixture to cornmeal/flour mixture. Very gently using a large spatula, fold to combine. Do not over mix here, it is ok to have some dry ingredients, the cake will bake perfectly. If you over mix, the texture of the cake will be tough, so be gentle. Add one large ladle full of batter to the mashed blueberries in the pyrex, mix gently with spatula. Pour 1/2 of the main cake batter into the prepared cake pan. 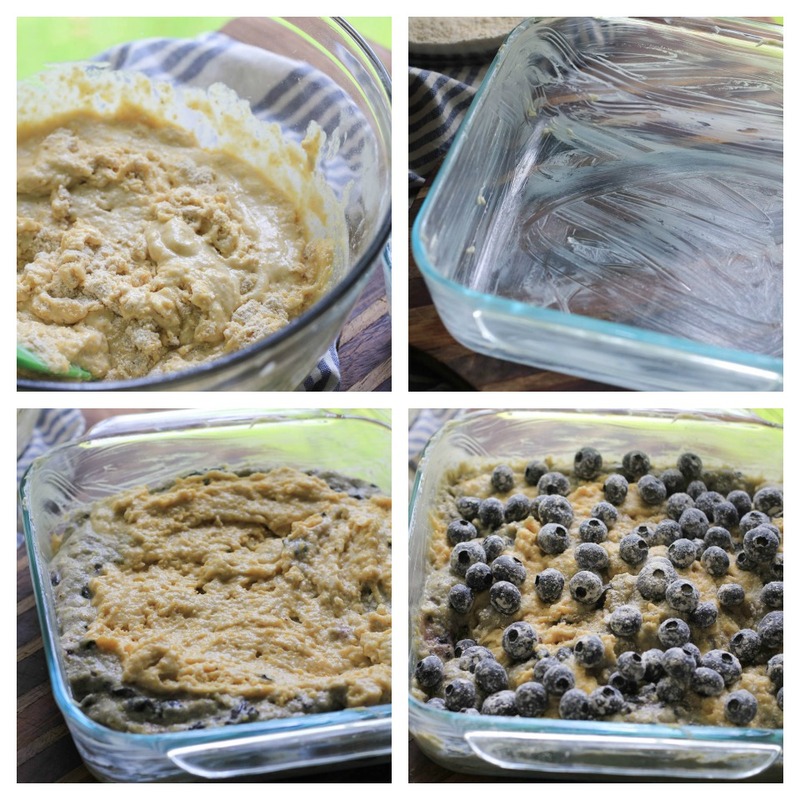 Add blueberry batter to top of cake batter in pan. Add remaining cake batter to top of blueberry batter. Using a butter knife or back of a wooden cooking spoon, gently swirl the cake in several directions to create the swirl. 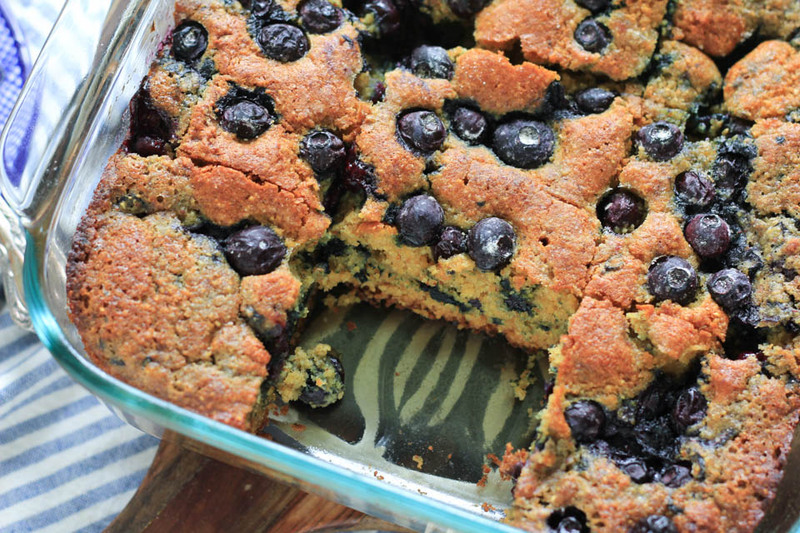 Using your hands, top the batter with whole blueberries. Place cake in oven and bake for 30-35 minutes, or until toothpick comes out clean from center of cake. Allow cake to cool for minimum 30 minutes before slicing and serving. Once cake is cool, top cake with plastic wrap and it will last on counter for 2-3 days.